Whether you’re flying for business or pleasure, a comfortable flight can make all the difference to your trip being a happy one. 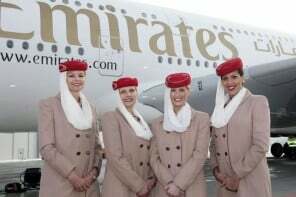 Coming off a 16 hour flight, with bad back aches, cramps in your feet and a grumbling stomach is not a good omen for anyone, so airlines have been working tirelessly to ensure that their customers travel in the lap of luxury. Some of the first class cabins on this list actually make traveling by private plane look almost Spartan. 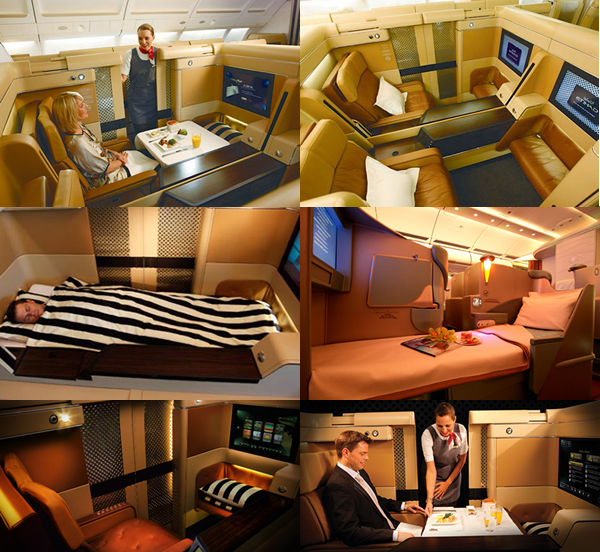 This list highlights which first class cabins will leave you rejuvenated after that long flight. 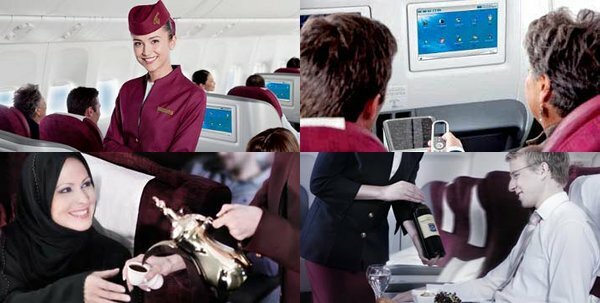 Qatar Airways has been voted a 5 star airline by Skytrax and has been ranked the World’s top airline for two years running. At Qatar Airways they embody Middle Eastern hospitality, as they are attentive whilst still being discreet. You are chauffeured to the aircraft in a BMW 7 series; they then proceed to match the luxury of the BMW on board. You can turn your personal space into a 5 star restaurant with a menu designed by 4 expert chefs which is further complimented by an extremely long wine and champagne list, all of it served on fine bone china. You can also choose to convert your personal space into an office, movie theatre or a completely flat bed. 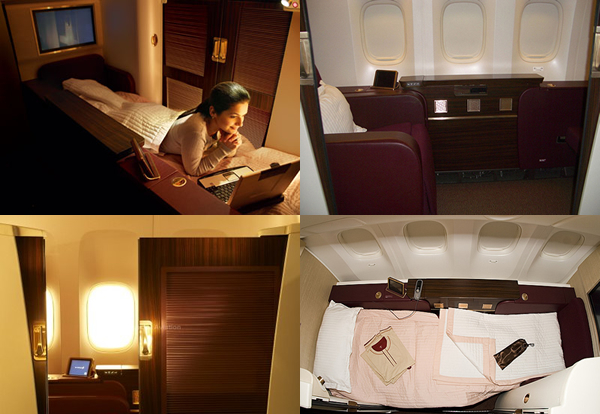 Qatar airways will even offer you turndown service should you choose to sleep. 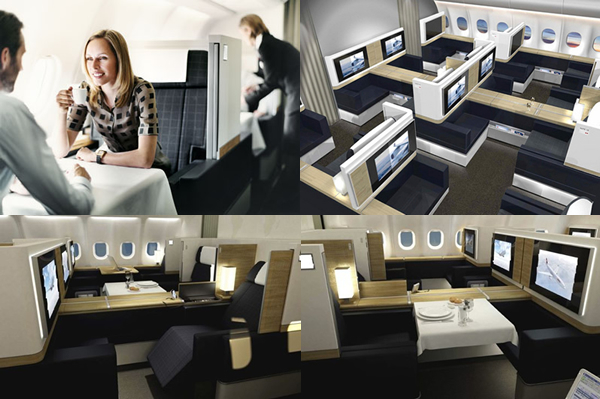 While Air France does not provide you with your own private cabin, it does come with a private space that is all your own. The seat converts into a complete bed fitted with both a mattress and a duvet. A 10.4-inch interactive screen along with a PC power outlet will ensure that you stay entertained on those long flights. Each seat is equipped with an auto massage function that will help relax you, ambient lighting adds to the relaxing environment. The attentive service that you will receive is unparalleled, as the Air France Stewardesses work to ensure you are comfortable. 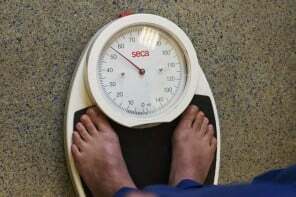 A menu created by Michelin starred chefs Guy Martin and Joel Robuchon will mean that you are likely to put on some weight before your holiday has even started. A well-stocked wine cellar is just the cherry on top of this incredible experience. Privacy is usually unheard of on airlines, but Jet Airways’ new fleet of 777s offers passengers 26 square feet of privacy. Hidden behind venetian sliding doors a passenger can find peace away from crying babies and loud snorers. It’s wardrobe drawers will offer you the opportunity to store necessities while personal lights means never getting dirty looks as you turn your reading light on. The chairs convert into 83-inch beds and come with an eight-point massage system. Entertainment in the form of a 23-inch LCD screen means never being bored. For the more cultured Jet Airways provides a vast e-book and audio book library as well a chance to learn a foreign language with a Berlitz World Traveler course. 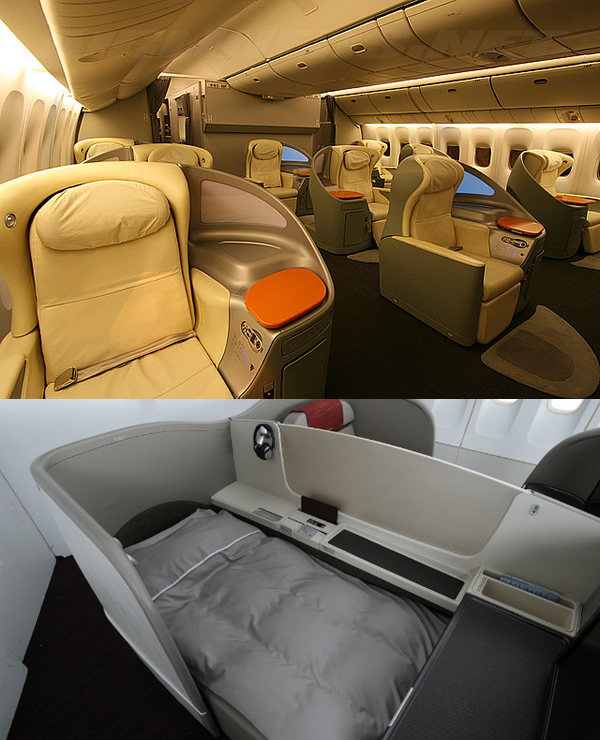 Like everything Japanese, Japan Airlines suites aboard there 777s have been designed to look deceptively simple. 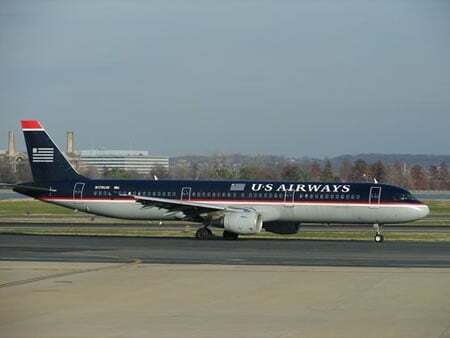 They seem to offer the same comfortable chairs as any other airline. However a closer inspection of the entire set up reveals oversized lap trays, height adjustable ottomans and reading lights with six different brightness settings. To ensure you are perfectly comfortable for your whole flight they have ergonomically designed leather seats and a mattress that has been designed to evenly distribute the pressure and weight of your body. The specially designed mattress was developed by JAL and Tempur and is complemented perfectly by Symphony’s signature marshmallow like pillows. Lufthansahas the unique honor of being the only airline that offers first class suites with a separate seat and bed rather than a seat that converts into a bed. 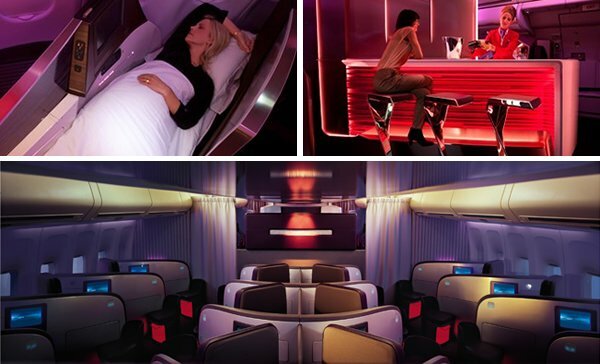 Their 747 cabins have been reduced by half to accommodate the customer’s every whim and give each individual passenger their own personal space. The cabins on theA380’s go further by offering automated humidifiers for each personal cabin, thus finally offering a solution to the dry skin you experience post flight. Chocolate and caramel hued suites are equipped with sound absorbing curtains, floor insulation and a 6 and a half foot bed. 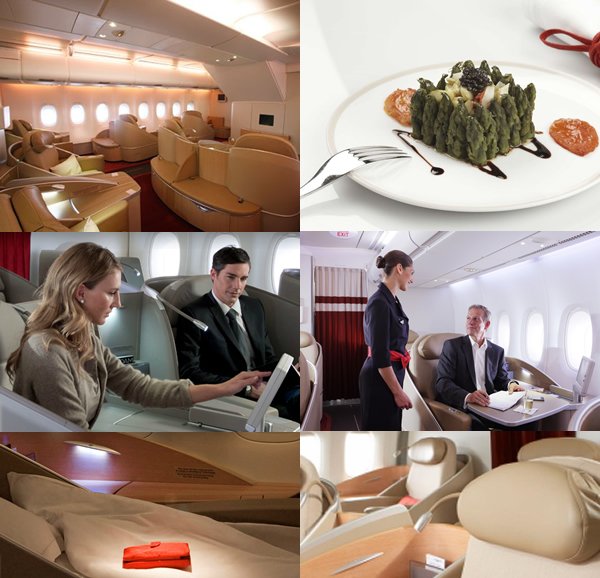 Etihad’s first class has been voted best first class for two years in a row by airline review website Skytrax. Their Diamond first class suites, live up to their name as they are each individually sealed behind Jaali screen sliding doors. Inside these individually partitioned suites you will find 23-inch entertainment screens, personal mini bars and chestnut Italian leather seats from leather experts Poltrona Frau which of course convert into 80-inch flatbeds topped with Dupioni silk and cotton duvets. The icing on top of this incredible suites are changing rooms featuring full-length vanity mirrors and amenity kits by Swarovski and La Prairie. 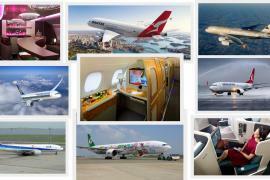 READ: Spas, space and extravagance is what airlines have to offer! Swiss airlines unique air cushion technology seat designs have won awards for best seat design for two years from Global Traveler magazine. Their uber private pods come with a twist as whilst offering you privacy in a private suite they also allow you communication with fellow passengers with adjustable partitions. The cabin features luxurious wood paneling and comfortable sleeping options as well as incredible amounts of entertainment. 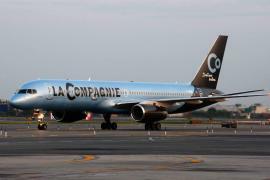 Most importantly of course is the food and beverages offered on the airline such as vintage Madame Cuvée and rare alpine cheeses. All the food is of course served on luxurious bone china plate. 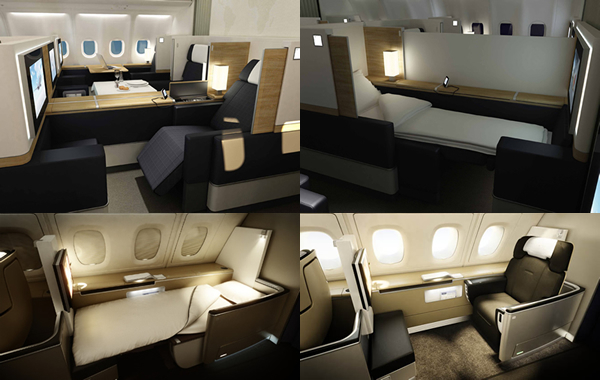 The first class suites on Singapore Airlines’ A380s have been created luxury yacht designer Jean-Jacques Coste. 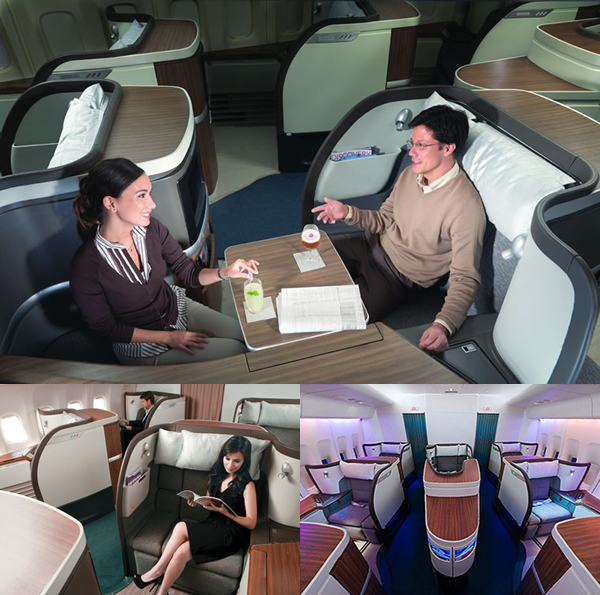 When first introduced in 2007 these suites were revolutionary with their 78-inch bed, 23-inch screen size and 35-inch seat width. 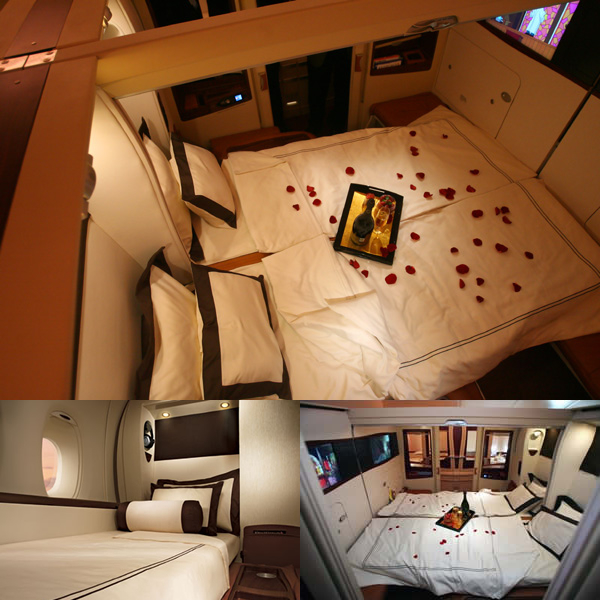 Thus the entire suite was built to give the ultimate experience to passengers. The cabins are fully encapsulated and give you an entirely private experience. The beds feature accented hand stitched Italian leather and are trimmed in burrwood. A plus mattress and Givenchy bedding mean you literally sleep in the lap of luxury. Feast yourself on lobster thermidor and rack of lamb. Couples can even get some alone time together by forming a double bed. Emirates A380s first class shower spa suites offer an incredible and refreshing experience that is truly unique. The suites offer complete privacy each with a sliding door featuring massage enable leather seats that convert to flatbed, topped with plush mattresses. The two bathrooms in the first class section are equipped with shower stalls, marble sinks, timeless spa toiletries and fluffy towels. 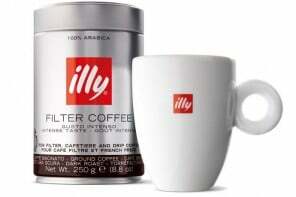 Thus allowing you to be completely refreshed even after a 16-hour flight. 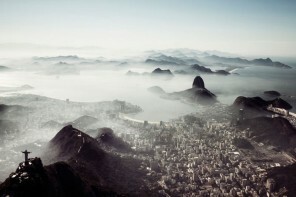 Snack on labneh balls, Iranian caviar while you sip on drinks from your own personal mini bar. Each suite is filled with ambient lighting and a vanity table with a mirror. 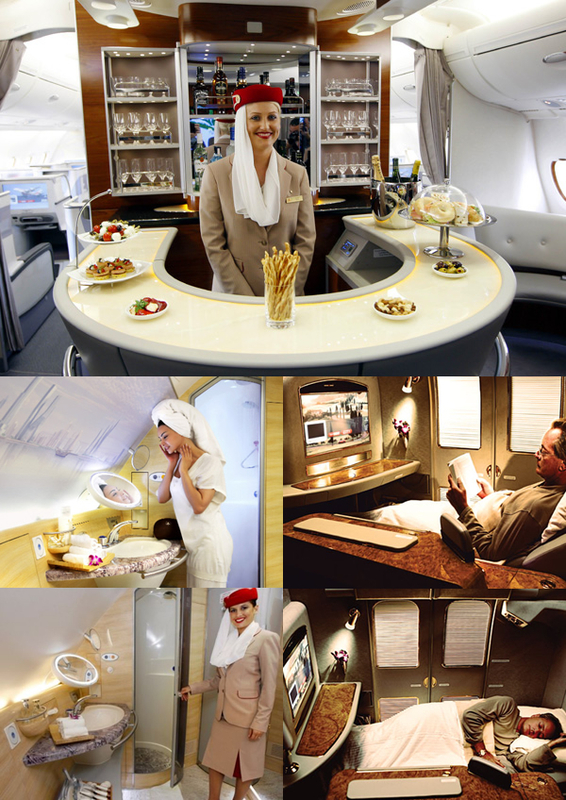 Definitely one of the most luxurious flight experiences you could possibly have.